At the Battle of Waterloo the complex of Hougoumont was a significant problem. It was forward of the Allied line and helped protect Wellington’s right wing, but it was not a serious obstacle if the French were to push the Allies back to Brussels, so it could be contained or to an extent ignored. However on the day the French committed ever larger forces to capturing it, ultimately expending far more resource than such a minor objective deserved. The many brave infantry assaults all failed, making the action an important sideshow which merely delayed and weakened the French until the arrival of the Prussians sealed their fate. By labelling these figures as belonging to a specific day the task of verifying accuracy is made easier, which in this case is very, very bad as these figures are far from correct for Waterloo. All wear the coat that was replaced from 1812 by the new 'Bardin' habit-veste, and while this new garment took many months to appear in all units it seems that by Waterloo it was universal. Worse yet nearly all have the style of turnback that disappeared in 1810, and was definitely not to be seen by 1815. Given the rush to organise the army after Napoleon’s return from Elba the French army at Waterloo was far from properly uniformed, but while the occasional old coat may have been seen there was certainly not the numbers implied by these figures, and the long tails and curved lapels make correction exceedingly difficult. Many have shakos which are covered, which is fine, and a few have the bonnet de police forage cap, which again was replaced from 1812 by the pokalem. Those with uncovered shakos reveal a style of badge long discarded by 1815. Most have campaign trousers, which is okay, and many are missing the rolled blanket/coat on their knapsack, which would seem reasonable given the state of affairs on the day of the battle. For the Hougoumont battle you might expect many poses advancing and others climbing walls or shooting up at defenders - maybe even a couple of hand-to-hand poses as close-quarter fighting did occur. Well there are some advancing poses, but all the rest are entirely missing. What we have instead is a pretty standard selection of Napoleonic poses which make no reference to the particular fight mentioned in the title. We were not impressed with the advancing poses, which are shown in the middle row and are even more flat than the rest, although the shooting figure does at least seem to be firing a little high. The wounded man is the only novelty (although he is obligingly falling to one side, so again very flat! ), but we did like the inclusion of the 'second colour-bearer' - the middle figure in the bottom row with Carabinier-style helmet and halberd, whose job it was the protect the colour. Sculpting is not attractive either, with fairly chunky detail and some less than natural postures, but there is no noticeable flash and the chosen poses mean there is not extra plastic to be removed. The flag is mercifully unengraved, and despite seeming small is actually the correct size (it was the eagle that mattered more than the flag anyway). The men are a mixture of fusiliers, grenadiers and voltigeurs, and are correctly dressed and equipped for their type. 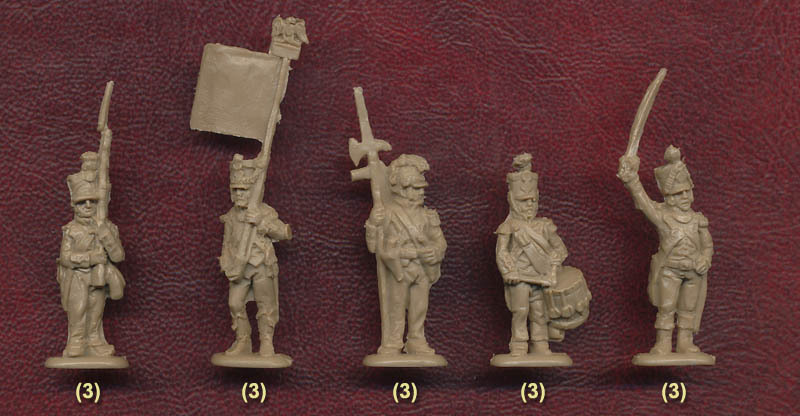 However the accuracy mark for this set is very low as these figures are not suitable for Waterloo, but instead could be used for battle during the period roughly 1807 to 1811 in our view. If they had been labelled as such then the accuracy mark would have been much higher, but as it is forget the Hougoumont title and treat these are more reinforcements for the middle period of the Empire, although much better examples of these troops have already been made by others.